Neo4j 1.9.4 - Installer? Check! Desktop Launcher? Check! Neo4j 1.9.4 – Installer? Check! Desktop Launcher? Check! People love Neo4j for many good reasons. The Windows installation however isn’t usually at the very top of this list. With today’s release, we are making it a lot easier to run Neo4j Community on Windows. 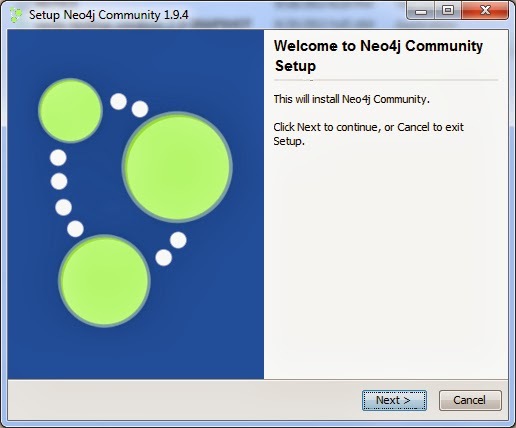 Neo4j 1.9.4 Community Edition introduces a Windows installer, coupled with a simple launcher that lets you choose a target directory, start your database, and run in the system tray. The installer affects the Community Edition only. Among other things, it bundles in Java, avoiding the need to download & install Java separately, and adding another measure of convenience. It’s quite straightforward, but if you have any feedback or ideas for improvement, we look forward to hearing it. Enterprise is not changing for the time being: we figure that Enterprise customers place a high value the configuration & tuning flexibility that comes from running the JVM independently. Over time we will revisit Enterprise and may add an installer. The Desktop Launcher is a very simple application that lets you start and stop Neo4j, and launch the web UI. It was primarily developed with Windows in mind, but we have found it to be a nice added convenience on Mac & Linux. It is therefore being made available on those platforms as well. The Desktop Launcher is likewise being made available for the Community edition only. Enterprise may follow over time if you find it useful. For those of you who need Community Edition in the older format, we will continue to build the zip package. If you do, please let us know why, as this will help us understand your deployment needs. We hope this will make it easier and more convenient to develop with Neo4j. Any suggestions, please drop us a note! For the full changelog, see the Changelog file on Github. If you are running Windows 8 you might get a big blue warning saying that “Windows protected your PC”. Please select “More” and “Run Anyway” to run the Neo4j installer.